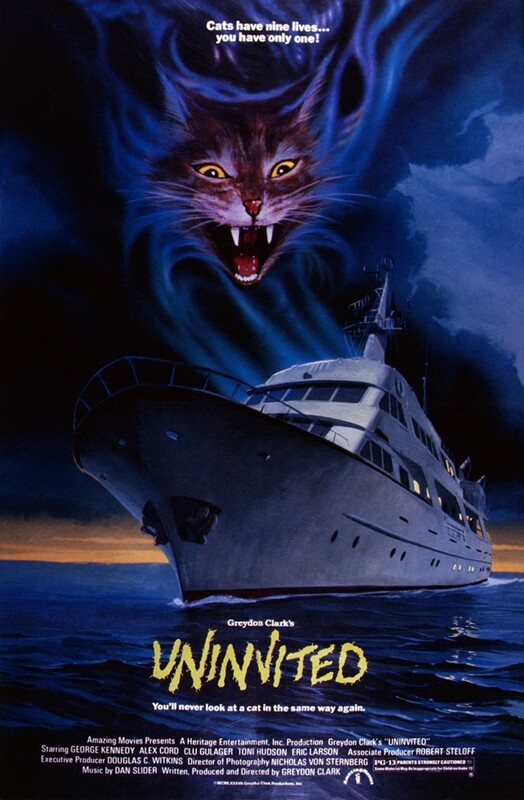 John’s Horror Corner: Uninvited (1988; aka Killer Cat), an evil mutant “cat-in-a-cat” movie. 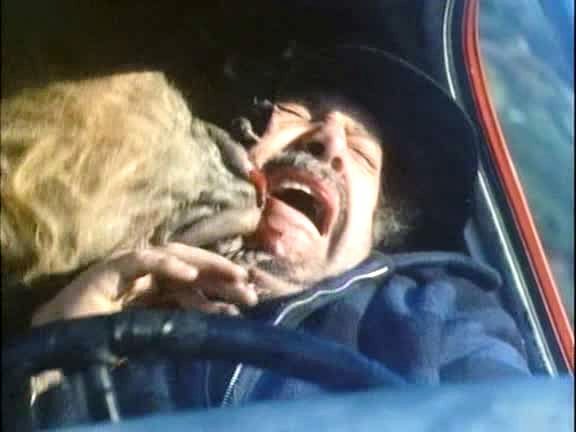 MY CALL: This B-movie is for those of you who want to enjoy a few laughs watching victims get killed on by one by a wacky monster cat whose rules I don’t really understand. 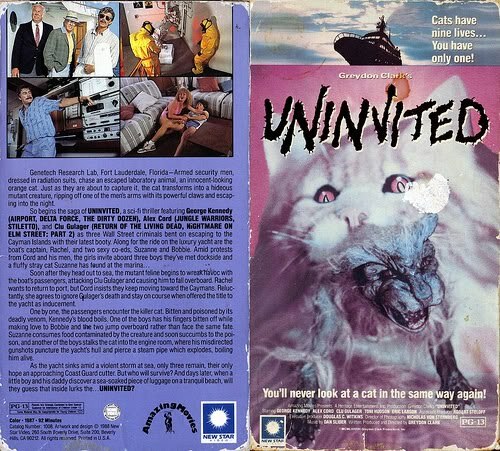 MORE MOVIES LIKE Uninvited: This sounds a lot like Man’s Best Friend (1993). 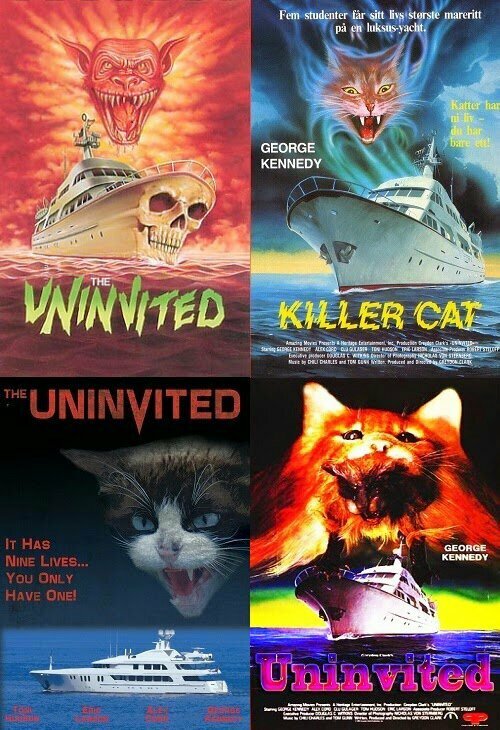 For more cats in horror movies, try Tales from the Darkside: The Movie (1990), Two Evil Eyes (1990), The Uncanny (1977), The Kiss (1988), Pet Sematary (1989) and Cat’s Eye (1985). Imagine if you will a cat… escaping from some sort of maligned research facility. A totally normal looking cat. 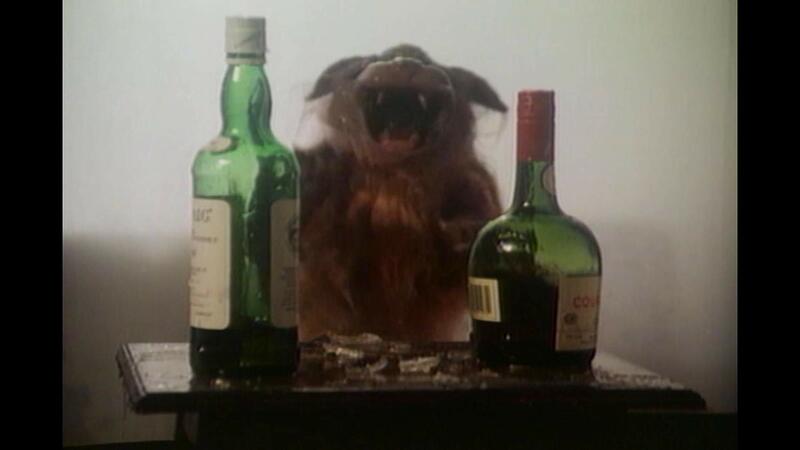 And then imagine a smaller, meaner, uglier, evil cat emerges from its mouth and its assailant explodes in blood off-screen. Writer and director Greydon Clark (Without Warning, The Return, Satan’s Cheerleaders) must’ve been a fan of Aliens (1986). When this cat attacks it’s laughably like a hand puppet being shaken in the victim’s face—and I’d say that’s reason enough to watch this! Wallstreet criminals Mike (George Kennedy; Just Before Dawn, The Terror Within, Creepshow 2) and Walter (Alex Cord) invite two college girls to attend their yacht party. Nervous about the expectations behind their invitation, Suzanne (Shari Shattuck; Death Spa) and Bobbie (Clare Carey; Zombie High, Waxwork) invite three boys to join them. 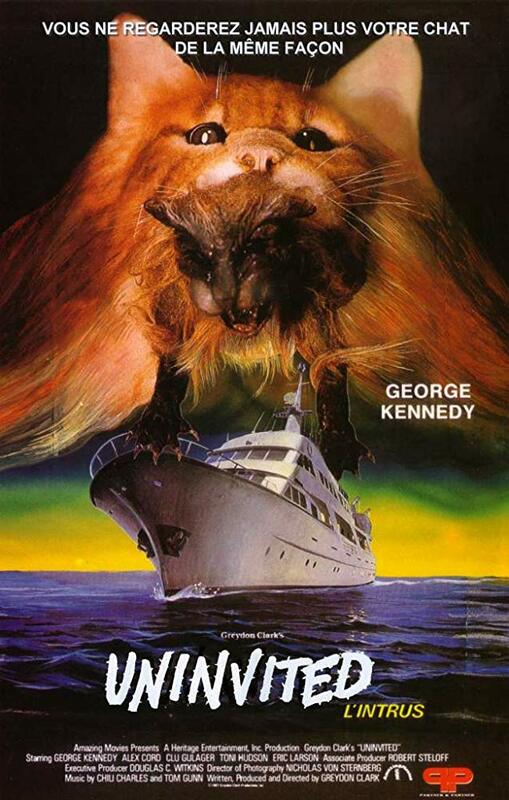 When the escaped mutant cat wanders onto the yacht, Suzanne insists on keeping it for good luck. We come to learn that this cat has been genetically engineered and that it has toxic saliva. I’m a bit confused as to how this cat transformation works. 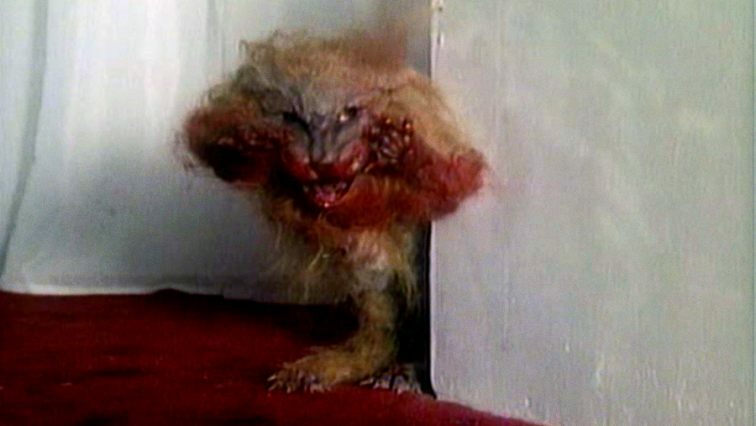 I’m beginning to think the little cat comes out of its mouth and flips the cat inside-out into monster-cat—which almost looks like a monster from Ghoulies (1985). But then later we actually see the little demon cat completely outside of the limp husk of a regular cat… so is the regular cat like a disguise it wears? And when the little one emerges, it then grows even bigger than the original cat suit only to shrink back down when it re-enters the cat suit? None of this makes any sense. BUT… it is fun to watch! 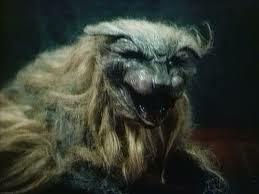 This mini-werecat nearly gorily tears out a guy’s Achilles’ tendon, gnaws off part of a guy’s hand, one poor dude dies from gooey face melting, and others fend off infections resulting in random blood-gushing. Ultimately, this is a stupid movie about a monster whose functional rules I still don’t understand. But that’s perfectly fine because it made me giggle. 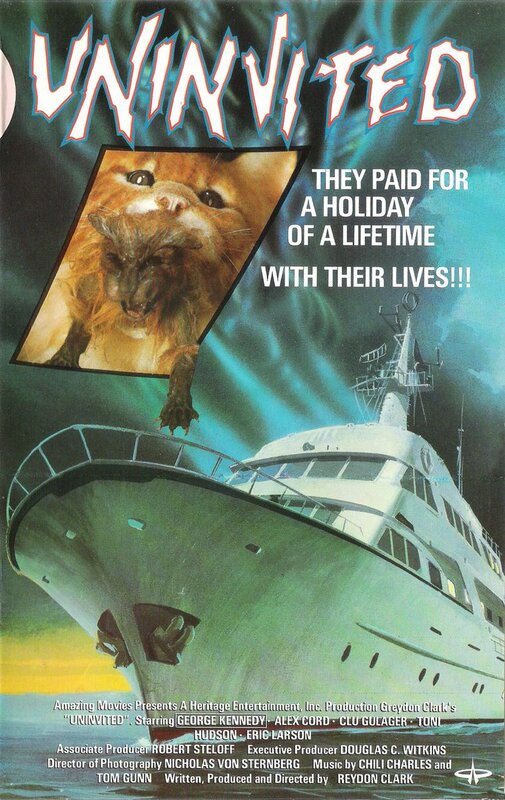 So, if you want a few giggles, watch this dumb killer cat movie. ← John’s Horror Corner: The Hills Have Eyes (1977), Wes Craven’s cannibal cult classic. Cat in a cat – love that!